Chuck Joiner recently invited me to discuss PartySnapper on MacVoices #15077. We touched on how PartySnapper performs its magic, security features to make sure only what you want to share gets shared, and how PartySnapper supports other camera apps. Thank you Chuck, for having me on the show. It was a blast! We used BoinxTV to create the fancy virtual backdrop and used Skype to transmit the video to Chuck. Apple has approved version 1.0.2 or PartySnapper and it is now available as a free update on the App Store. In addition to fixing several bugs, PartySnapper 1.0.2 enables peer-to-peer sending of images to the party host when both devices are running iOS 8.2, eliminating the need for a dedicated Wifi network. Apple Authorised Professional Educator Julain Coultas found a very cool way to use PartySnapper: Running on the teacher's iPad, students submit their work in progress as images to the photo wall for everyone to see and discuss. This way, the learning progress is documented visually, motivating students to learn and improve. Move over Instagram, PartySnapper has arrived! Our newest iOS app is sure to impress party-goers around the world. 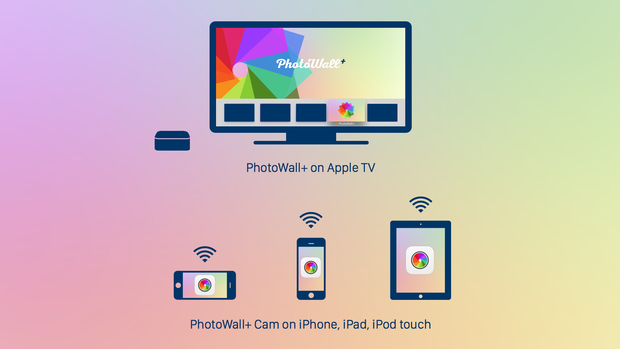 By allowing party hosts to collect all photos taken at a party in one location, guests are engaged and connected to all the action as their personally snapped photos will instantly stream onto a venue's surrounding screens. PartySnapper was originally invented by our very own video guru, Bastian, for his very own wedding back in 2012. We saw his makeshift app in action and knew we needed to make it a reality. Now, it's time to bring a special touch to your next event and download PartySnapper today!